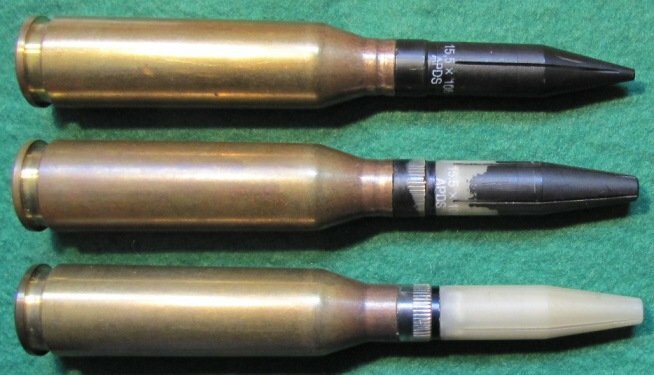 The 15.5 x 106 mm was the last round in the developmental series of heavy machine gun rounds developed by FN to replace the .50 BMG and some 20mm weapon platforms. Work began in the early 1980’s and the project concluded in the early 1990’s. 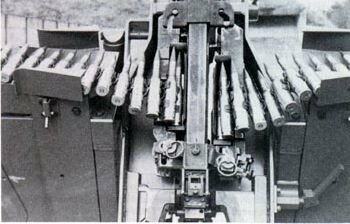 One feature of the BRG-15 weapon was a dual feed system. 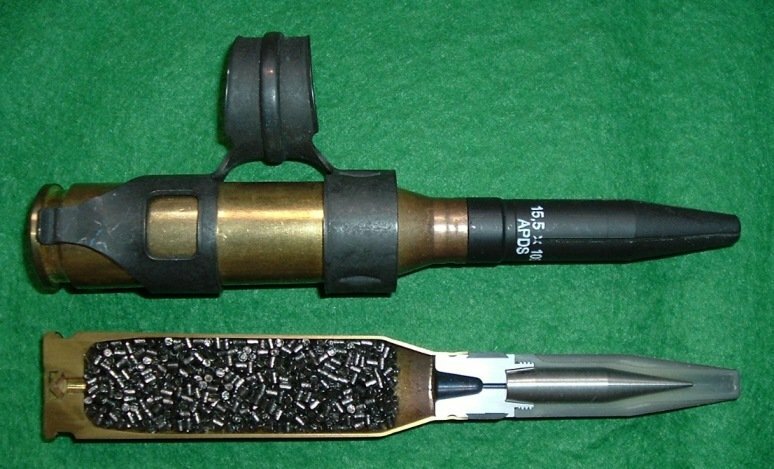 This allowed for ordinary loads (ball, AP, tracer, etc) to be fired in semi or automatic mode while the other feed could be loaded with ammunition for more specialized targets – namely the use of HEPI (High Explosive Penetrating Incendiary) or APDS (Armour Piercing Discarding Sabot). Additionally the gun could be fired in semi or full automatic modes. The semi-automatic mode allowed for more accurately aimed fire. The APDS ammunition is typical in construction with aluminum boot, tungsten core and full caliber 3-petal plastic sabot. The tungsten penetrator weighs 35 g. Note the plastic driving band. The driving band was unique to this caliber within the series of developmental projectile. Below are three variations. In all instances, the plastic sabot is whitish in colour (like the bottom round) but note that top is completely painted black while the center round is only partially painted. A note about headstamps: the earliest 15.5 x 106 rounds are headstamped 1987 and have angular extractor grooves. The later (and final) case design was without headstamp and the extractor groove was beveled. These APDS loads are loaded on the final case design.